We have the best selection of high capacity games and activities for kids, teens, and adults in Colorado and this 8 player wrecking ball game will keep the lines moving. 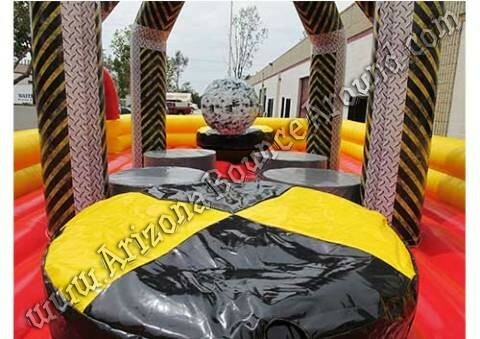 It features 2 Inflatable Rock n Roll pedestals in front of each entrance and a 4 player wrecking ball game in the center. The Rock n Roll pedestals are fun to try and knock each other off or play king of the mountain type games. Keeping the lines moving at big events is the key so adding multiplayer games like this one will surely help. We have the best selection of high energy games and activities in Denver so call, click, or come by today and let us get to work for you.